Gymnastics Camp At the Matinee is an exciting day camp experience for boys & girls ages 5-18. We do all kinds of fun activities throughout the week! We also do more gymnastics training than typical gymnastics camps. We do daily arts & crafts, the infamous "charm" contest, and make video commercials that will be posted to YouTube! Come 1 week or come all 4! 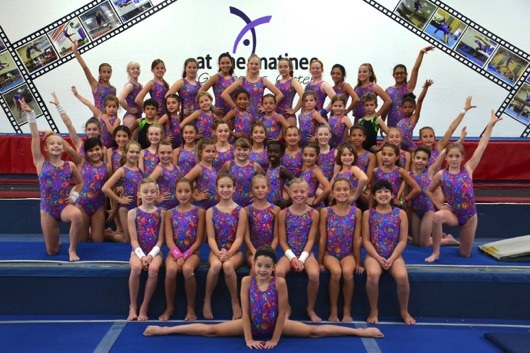 Gymnastics Camp at the matinee is a structured gymnastics camp with plenty of time for FUN too! We have a structured work-out - gymnasts work in groups based on their current skills and determination to learn new skills. This year, the gymnasts will be receiving matching camp leotards and boys competition shirts with their first week of camp registration. You must get your registration in by May 15th to guarantee your leotard arrives in time for camp. Registration forms can be found on the front counter at the gym. The Last week of camp is TEAM CAMP. In order to attend TEAM CAMP, gymnasts must be signed up for 2 or more weeks of camp. Gymnasts attending this week MUST be USAG Level 2 competitors or higher - Sorry, no exceptions. A small CAMP with a lot of individual attention!